Do blogs have birthdays or anniversaries? I tend to think of The Non-Blonde as a live creature. Cute but exhausting at times. Not to mention high-maintenance. Six years ago today I decided that I had more than enough to say about beauty, and that perhaps I could do it well enough for a public forum. Looking back, I'm amused at my chutzpah, but glad I had it. Otherwise I wouldn't be here, six years later, doing something I love dearly, learning new things every day, and meeting so many people who enrich my life. Thank you for reading, tweeting, commenting and facebooking. You are the reason I'm still here, spraying, swatching and trying stuff so you don't have to. 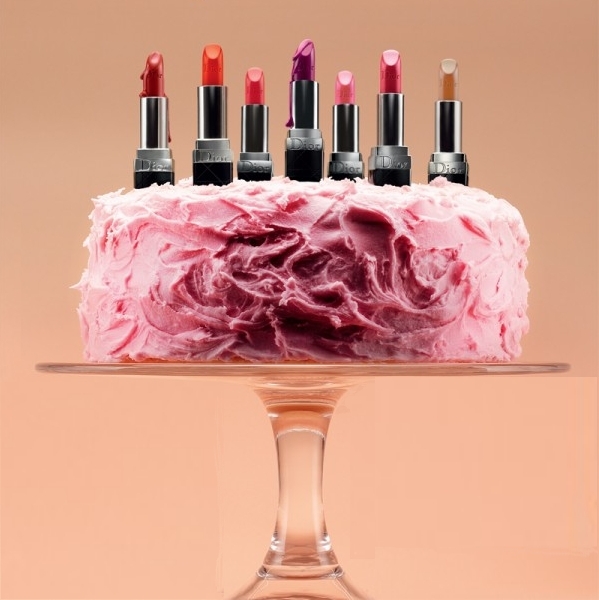 Photo: Dior birthday cake from Amica magazine. Happy Birthday to the Non-Blonde! Gaia, you put SO much into this website. Thank you for all of your work, your beautiful perfume reviews, and your endless supply of kitteh pictures. Thank you so much, Ari and Zelda :) . So happy to have you both in my life. Thanks, L. . You're a pretty wonderful and wicked enabler yourself. Happy Birthday to this wonderful, amusing and informative blog! Thank you! My readers and fellow-bloggers are the best. Thanks, Jane. I'm so glad you joined the blogging forces :) . I'm so happy for you, congratulations! I always enjoy your perfume, skincare and makeup reviews, even better when they are accompaniedi by cute kitty pics! I have you to thank for my new appreciation of Edward Bess and Le Metier de Beaute products. I would not have known about them had it not been for your website. Thank you, lovely Elizabeth. I love hearing that I helped someone find new pretties to love. Thank you. Methinks I need to post more cat pics soon :) . Jessica, you're one of the most wonderful people I met through blogging. I'm so happy to know you xoxo . Yes, the cats too!! Happy birthday to your blog, and thanks for all of the work you have put into it. Thank you. It's wonderful to be recognized and appreciated. Happy Anniversary/Birthday! This is a wonderful blog. It has introduced me to so many terrific beauty/perfume products. Which is great for me, not so great for the budget. However, I don't know what I would do without my Hakuhodo brushes!!! They are heaven. Thank you Gaia. Thank you, Tara. I'm so happy to share and spread the Hakuhodo love. They're magic. Oh Zanne, thank you so much. Your comments are always a wonderful treat. Readers like you are teh reason I keep going xoxo. Best wishes and many, many happy returns! Thank you, Eleonore, from me and from the cats. I'm deeply touched. Happy Blogiversary! Thank you for introducing me to perfumes I can actually wear and like and to hakuhodo make up brushes! Thank you! I'm so glad to hear I helped you find new loves, especially in perfume! Thank you Gaia, for so many hours of fun. Thank you for reading, Fernando! Congratulations! Your blog is a blast! I've learned so much here, and had so much fun! Thanks you! So thrilled to know that my little experiment from six years ago brought fun and enjoyment to others. Happy anniversary Non-Blonde, I'm so glad you decided to do this wonderful blog! I love reading your posts, even about perfumes that go way over my dead olfactory sense. lol At least you get me to try perfumes I wouldn't have considered before. Just wait until the 10th anniversary! Thanks, Evelyn, for reading and commenting. I'm always happy to see your name here. Trying new stuff and being surprised is so much fun, isn't it? I am so very glad I found this blog! Said it before, and saying it again, "The Non-Blonde is the 'Consumer Reports' of all things glam!" May the next six years be as exciting and fun as these first six years. Sweet Lawrence, I'm so glad you found my blog. Your comments and friendship are very dear to me. Love to you and to Lady Rosa. Joyeux Anniversaire and many more blog-birthdays to come! Thank you, Lovely. I hope you're well! Thank you, Mimi. I'm honored. Thank you, Dusan! This is wonderful to hear. Happy Birthday! I wish you many returns. I always look forward to your reviews, beauty product recommendations and your cat photos. Thank you, Victoria. You've always been an inspiration and I'm thrilled to know you and call you my friend. Thanks, Alyssa :) The blog and I are aging very publicly (and I hope also gracefully, blue eye shadow and all). Congratulations! I"m so glad we met via Lucy. Thanks, Francesca. I hope to see you again soon. Happy Blogoversary, Gaia. Six years is quite an accomplishment, even more so considering the amount of well-written and professionaly presented reviews you have here everyday. Best wishes for your continued success! Thank you, Suzanne! I'm in good company :) . Happy Anniversary Gaia and Happy Birthday The Non-Blonde! Thank you, Tom. Meeting my scent twin was one of blogging's biggest rewards. Happy 6th Anniversary! Thanks so much for being here. I thoroughly enjoy your posts, especially your brush reviews! Thank you, Joolz. I promise that many more are coming. Happy anniversary! I don't comment much, but I read everything you write, and I appreciate all the work you put into this blog. Thnk you, Adele. Your comments are always so very thoughtful. Thank you, Charlotte! It's a labor of love, but still labor :) It's wonderful to feel appreciated. Dear Noz, thank you so much! I'm all verklempt hearing this. Thank you for reading and commenting. I hope the inspiration will stay with you for many more years. Wish you many-many years of beauty!!! Thank you so much for inspiring my days with perfume and beutifying suggestions... and for your unique and so enjoyable voice. It feels like home here! Buon compleanno e 100 di questi giorni!!!! Happy 6th anniversary! Thanks so much for thoroughly written, witty reviews and beautiful photos (especially feline ones!). Oh, also huge thanks for my fave fragrances L'Air du Desert Marocain and Orange Star. Without your reviews I might not be enjoying them. Happy Anniversary/Birthday! Congratulations on 6 years of great writing and many incited lemmings! Happy Anniversary Gaia! I love reading your posts and discovering new quality brands to try based on your recommendations. Best to you and keep it up! Felicitations! and thanks for your tenacity, it can't be easy! You do a great job! Of course six years of blogging is worthy of celebration. Congratulations! That's six years of hard work, with a little fun mixed in. Your passion and knowledge shine in your words. I'm grateful to read The Non-Blonde and to be able to call you my friend. Happy 6th Birthday, Gaia! Your blog was one of the first to inspire me to take the plunge & begin my own, and for the record, I think your chutzpah is awesome - never stop! *Raises a glass*: here's to many more ! Happy belated blog birthday, Gaia. Six! Yours must be one of the first beauty blogs, surely. I do know TnB was one of my first happy discoveries when I learned such things existed. Here's to many more years.